Damonta Morgan is a senior majoring in History and Political Science in the College of Arts and Science. He is from a small town in the Mississippi Delta known as Clarksdale, MS (which you may’ve heard of as the birthplace of the Blues). 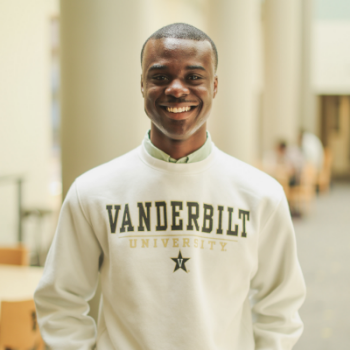 At Vanderbilt, he is involved in a wide array of activities ranging from singing a’capella tunes with the Vanderbilt Dodecaphonics to crafting legislation that improves the Vanderbilt experience for future Commodores as the Speaker of Vanderbilt University’s Undergraduate Senate. He is the 2nd of three children, and as of two months ago, he is the uncle of one nephew (his older brother just had a son). Damonta is excited to interact with today’s ideas worth sharing.